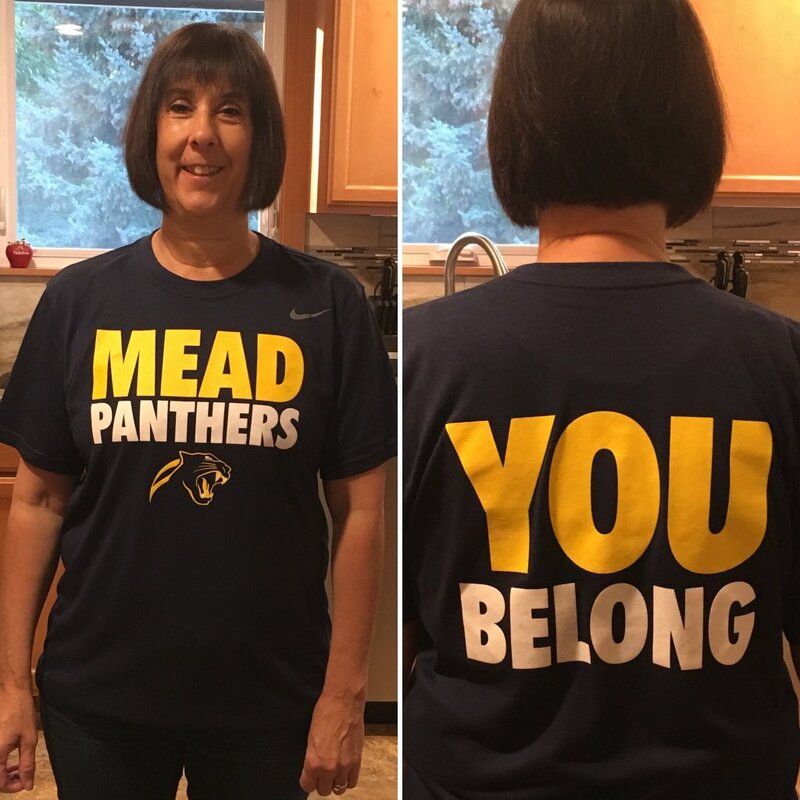 Today, my mom started her 17th year as a special education paraeducator at Mead High School. Her summer break has come to an end and she has my sympathies. However, my mom “going back to school” has also left me feeling a little down in the dumps. My mom started her 17th year at Mead High School today. You see, during the summer I am able to call my mom during my commute home from work. Now that school is back in session, I am unable to do this because she is still on the job when I am clocking out. As someone who doesn’t call home as much as I should, I am going to miss our summer afternoon phone chats. Worst of all, I recently found out that I was taking our calls for granted. It would work like this: After I called Sidney and checked in with her, I would then call my mom a few minutes later. We would usually chat right up until I turned onto our street (about 10 minutes), at which point I would start to wrap the conversation up. By the time I was parking in the driveway, we were saying our goodbyes. Little did I know how rude I was being. 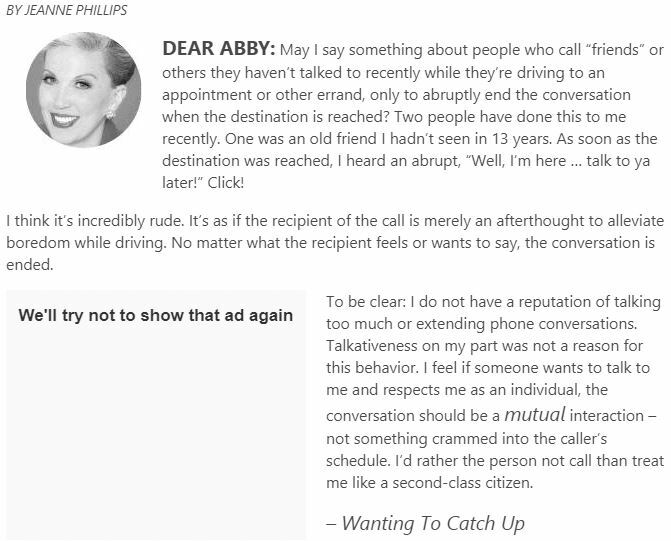 In a Dear Abby column over the weekend, a reader complained about people who call her only to pass time while driving. She noted that friends will phone her while in their vehicles, only to end the conversation once their destination is reached. In a damning rebuke, she writes “It’s as if the recipient of the call is merely an afterthought to alleviate boredom while driving.” See below for the entire letter. This opened my eyes to something that I was doing. Truth be told, the reader has a point…and the advice columnist thought so too. Abby called the act “insensitive” and mentioned that her own late mom would complain about callers doing the same thing. To put my lack of sensitivity in perspective, I admit that I had never even thought about the rudness of ending a call when I arrived home. My first priority was always to get inside as quickly as possible so I could see Sloan and Sid. But I never took a moment to consider the disrespect I was showing when I told my mom “Well okay, I guess I should probably let you go…” once our house came into view. In life, just because you didn’t have the intention of being rude doesn’t mean you weren’t rude. I need to own up with this one. Mom, I hope you had a great first day. Please accept my apology and know from now on that I will let all phone conversations between us end naturally, even if it means sitting in the driveway for several extra minutes. We can be oblivious to our actions. However, I do believe in the old adage of better late than never. I plan to never make someone an “afterthought to alleviate boredom” again. Don’t Blink. This entry was posted in Uncategorized and tagged Dear Abby by brent. Bookmark the permalink.